Over the past 19 years, Klamath Bird Observatory has hosted over 170 student volunteer interns from 16 countries and 23 of the US states. Our objective with each individual has been to create a safe and fun learning experience, with the hope that we impart some positive influence on their academic and professional careers. Certainly, we have enjoyed the company of some incredibly bright, energetic, and enthusiastic individuals. Luis Morales of Mexico interned with KBO in 2012. At that time he was laying the foundation for a new bird observatory in his native San Pancho, Nayarit, located on the Pacific coast of Mexico. Luis mentored with KBO Executive Director John Alexander as part of his training. The San Pancho Bird Observatory is now a healthy and growing organization advancing bird conservation and education in western Mexico, where many of our nesting songbirds spend their winters. Keith Larson of Washington interned with KBO in 2004 and 2005. He later completed a PhD at Lund University in Sweden studying songbird migration patterns. Keith is now a research ecologist with the Abisko Arctic Research Lab in northern Sweden, where he is examining the effects of climate change on Arctic ecosystems. Viviana Cadeña Ruiz of Colombia interned with KBO in 2002 and 2003. 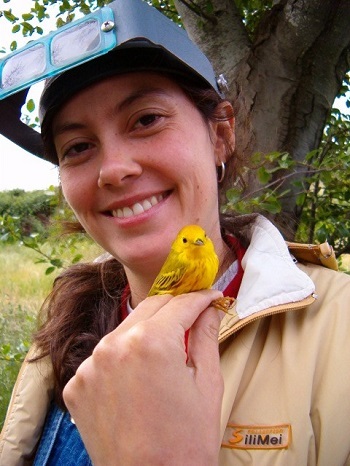 She later completed her PhD at Brock University in Canada on the effects of high altitude acclimation on thermoregulation. Viviana is now an eco-physiologist. She recently commenced a three year postdoctoral research fellowship with the University of Melbourne in Australia, where she is researching the adaptive significance of color change in bearded dragon lizards. These are just a few examples of KBO intern successes – former KBO interns making positive impacts in the world of science and conservation throughout the globe. Our hope, as always, is that their KBO experience has played some part in their accomplishments.